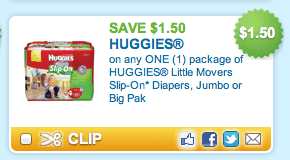 Hurry over to Coupons.com and grab your Huggies printable coupon to save $1.50 on 1 pack of Huggies Little Movers Slip-On diapers. As always, I encourage you to print this coupon now. You can combine it with one of this week's diaper deals or you might stumble onto a clearance deal when shopping for something completely different!